I want to continue my beauty study with another eye makeup product:) The one that I always take with me anywhere I go, the one that can erase the signs of staying up all night, the one that works miracles with my eyes and face and the one I didn’t know about (miserable me) before I have started to do the shows. Now, if I were asked the definition of the word “panicking” I would say that this is the feeling I usually get when I forget my Guerlain Issima concealer at home. No jokes! I use the #20 and it illuminates and moisturizes my eyes perfectly, no matter how tired I am. If you are like me, and the skin under your eyes is tender and can tell people the exact number of hours you slept by the shade of the dark on those circles, you will love the great masking effect and the light texture Guerlain concealer has! By far the best concealer I have ever used. Check out Guerlain concealer online in different shades. And make sure to check for discounts. 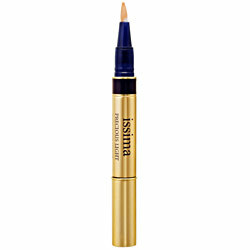 Guerlain’s radiance corrector pen: it hides imperfections, while lighting up and reviving your complexion. But that’s not all. It is also formulated like a skincare product to smooth, hydrate and diminish dark areas formed by fine lines, dark circles and blemishes. The ultimate touch of radiance, ideal for all occasions.